Nature has a brief “Research Highlight” on our recent PLoS One paper. Finding gene regulators in the fruitfly Drosophila melanogaster has proved difficult: looking for conserved non-coding DNA sequences, a method that works well in vertebrates, has been unsuccessful. 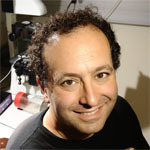 Michael Eisen at the University of California, Berkeley, and his co-workers suggest that this is because the fly’s genome is compact — not because its regulatory architecture differs substantially from that of vertebrates. Eisen’s group sequenced various loci from four species of tephritid — ‘true’ fruitflies — which have large genomes containing islands of conserved non-coding DNA sandwiched between unconserved stretches. This allowed the researchers to pinpoint six conserved tephritid non-coding regions that functioned as gene enhancers in D. melanogaster embryos. Until now, the compact size of the D. melanogaster genome has been considered a boon to scientists. This entry was posted in My lab. Bookmark the permalink. Both comments and trackbacks are currently closed.